With his background as an officer in Special Operations for the Israel Army, E.M.T CEO, Eitan Newman leads a staff of highly experienced detectives and investigators, each with his/ her own specialties that are utilized for any client's particular needs. E.M.T offers services to businesses, individuals, law enforcement organizations, attorneys, insurance adjusters, investigative reporters and private investigators from around the world. For any situation involving investigative or intelligence work in Israel and some countries in the Middle East, E.M.T is well qualified to provide clients with maximum results in a timely and cost-effective manner. Our network of contacts around the globe also enables us to serve our international clientele. EMT uses the latest state-of-the-art equipment to assist in cases of surveillance, security, and information gathering. Please follow the links to review our services and capabilities and feel free to contact us with any questions you may have. 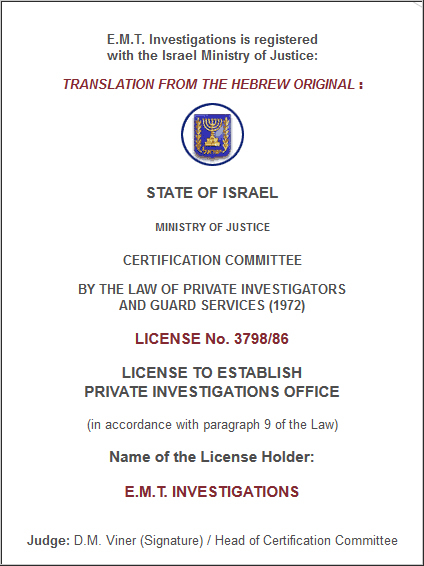 EMT is registered with the Israel Ministry of Justice.